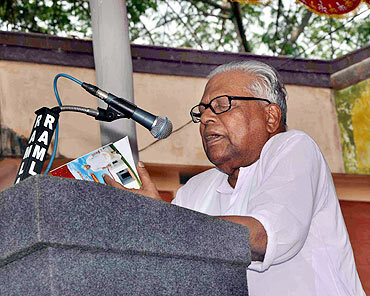 At 87, Kerala Chief Minister V S Achuthanandan is the senior most comrade of the Communist Party of India-Marxist. He is contesting from Malampuzha for the third successive time in the forthcoming assembly elections. VS, as he is fondly known, was born in Alappuzha in a very poor family. He lost his parents at a very young age and had to drop out of school. He started working in a tailoring shop and later moved to a coir factory, where he got involved in trade union activities. In 1940, he joined the Communist Party of India. In the Communist schism of 1964, he joined the group that would later evolve into the CPI-M. 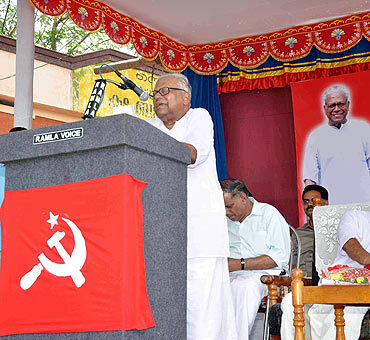 The feud between Achuthanandan and CPI-M general secretary Pinarayi Vijayan has been the talk of the town in recent years. In 2007, both VS and Pinarayi were suspended from the CPI-M politburo for their public spat. Later, VS was removed from the powerful politburo, where he had served as a member between 1985 and 2009, as disciplinary penalty for his open tussle with Vijayan. But in a quick chat with rediff.com's Shobha Warrier while campaigning in Palakkad, VS claimed that all is well between him and Vijayan. What will be a major issue in the forthcoming election? The development of Kerala will be a major issue. We are seeking re-election to continue the programmes we have initiated. Do you plan to concentrate on any particular area? All the sectors are important to us; agriculture, industries, IT, tourism, healthcare. Also, development will not be confined to any particular area in Kerala but throughout the state. What are your plans for the youth of the state? It is for them that we have built the techno park in Thiruvananthapuram. There is also a small park, the Infopark, in Kochi. We plan to develop ten such parks all over Kerala; from Thiruvananthapuram to Kasargod and that includes Cherthala, Koratti, Kundara etc. With ten IT parks throughout the state, lakhs of young people will get employment . If capitalist groups like the Tatas or Ambanis come to Kerala to set up factories, will you allow them to do so? We may not be able to give them many acres of land because we do not have that much land. But if they want only a small piece of land, we can, and we will (give them land). But if any American companies come here, we will not approve of that. We are against American investment; which is the most dangerous investment. What exactly is the problem between you and (CPI-M general secretary) Pinarayi Vijayan? I categorically say that there is no problem between us. The so-called problem between us has been created by some vested interests in newspapers of Kerala. Similarly, they also write about the problem between (senior state Congress leaders) Oommen Chandi and Ramesh Chennithala and also between (Indian Union Muslim League chief) P K Kunjalikutty and religious heads. This is a game played by some Kerala newspapers all the time. Do you think the Left Democratic Front will come back to power? There is no doubt about it; the LDF will come back to power. 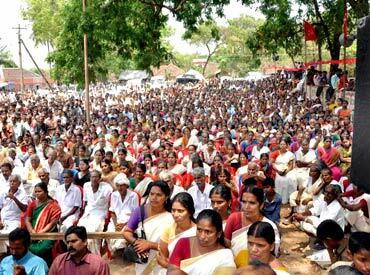 The people of Kerala want us to continue with the development programmes we have started in the last five years. We have undertaken a housing scheme and healthcare for the poor, which is a huge hit among the people. We have had record rice harvest in the state. There has not been a single suicide among the farmers in Kerala. We have promised 5 lakh jobs in the IT sector. On the other hand, the (Congress-led) United Democratic Front has 'spectrum money'! They have so much money that even in a small state like Kerala, the UDF leaders travel in helicopters! 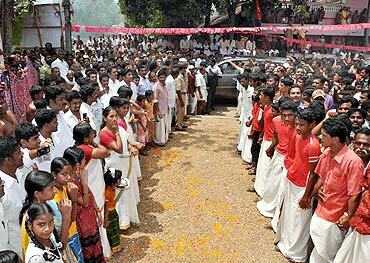 If the LDF comes back to power, will you become the chief minister of Kerala again? It is the party that will decide. As is the practice, the legislators will meet and elect the leader (after the election results). Nobody needs to worry about that. What is the big deal about electing the leader? I can't understand why everybody is so bothered about this. The talk among the people is that you are a good and clean chief minister, but your party is bad. They also say that you are not allowed to perform by the party and that your hands are tied? (Laughs) Nobody has tied my hands! It is in the imagination of some that my hands are tied. I have been working against corruption and nobody has ever stopped me from discharging my duties. Do you think there should be a retirement age for politicians? Why should there be? Do you know who led the freedom struggle in India? The senior-most political leaders. With their experience and wisdom, they led from the front. Similarly, even today, elderly political leaders can lead the country to a bright future. So, there need not be an age for the retirement of political leaders. How would you like the people to remember you? As a leader who worked for the betterment of the people. As a leader who solved the problems of the people without any delay.